Logan and I have this dream of owning a little piece of land where we would keep bees and have massive herb gardens and apple and peach and cherry orchards. We would keep ducks and goats. I would have a little porch cove to write and do photography. Logan would have a music studio where he could create house music and have acoustic jams and record our friends. We would eat pie everyday. We'd bounce around the kitchen and brew coffee, write weird limericks and high kick for no reason (we do that anyway). No doubts we'd probs have a little alter somewhere with lots of amethysts and votives and statuettes of Krishna and Ganesh and Jesus and Padre Pio. And we would have those dreamy Kinfolk-esque dinners on long, low tables in the backyard. Having an orchard is definitely high up on that list of must-haves for our dream future life. Apple picking is a necessity of Fall in Central VA. How sick would it be to go apple picking in my backyard?! It's practically the first thing any self respecting Virginian does to confirm to themselves that yes indeed they need to dust off their chest full of sweaters and boots and knee high socks. The pick-your-own orchards (Carter Mountain, specifically) are pretty crowded on a Saturday 'round these parts. There are loads of little kiddies eating apple cider donuts, their parents dragging them through the early pumpkin patches. Folks wind in and out of the kitschy shops set up with every apple related trinket known to man. The September sun beats down on you from the top of a wide hill covered in apple trees -- blasting out its heat in a last attempt to remind you of what rules the solar system. And you sweat your way through the rows of knobby trees weighted by greenish apples, just barely ripe. 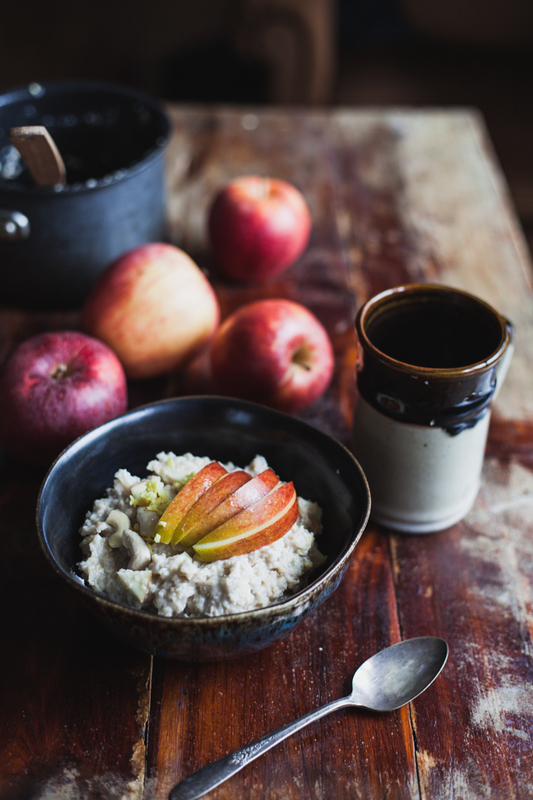 You kick mushy, fermenting apples down the alleys. And you call on your very tall friends to reach the pretty fruit on the high branches. It's half sweet, half obnoxious (lots of people in the narrow, muddy lanes in the orchard = constantly brushing up against pre-teens who really just want to throw apples at their friends). But I always dream of quiet outreaches of the food universe where I can do my fruit picking in a meditative trance. It's not possible, much of the time. I'm thankful for the fruit, always, regardless. Needless to say, I have a counter overflowing with apples -- so fresh that they'll store there for weeks and weeks. I've been seeking out new and interesting ways to eat them (chai apple cake anyone?). So after a particularly cold night this week -- Logan woke up shivering with just a sheet -- oatmeal was the first breakfast option in my head. Cashew cream hikes up every foods dreaminess level about 10 points (on a scale of 100). Which makes this a perfectly warming, creamy breakfast with stupid levels of 100% vegan luxuriousness. I didn't put vanilla to my oatmeal, but I think it'd be a most wondrous addition (1/2 teaspoon vanilla extract or 1/4 vanilla bean, scraped of its seeds). Drain the soaked cashew. Add your cashews to the cup of a high powered blender (Nutribullet or Vitamix are ideal). Add ¼ cup water and agave. Blend until creamy. If you find your having trouble getting the cashews to blend into a fine creamy texture, add a teaspoon of water at a time until you reach the desired consistency. Core and slice your apple into wedges (1 inch thick at the widest edge). Dice about ¾ of your apple. 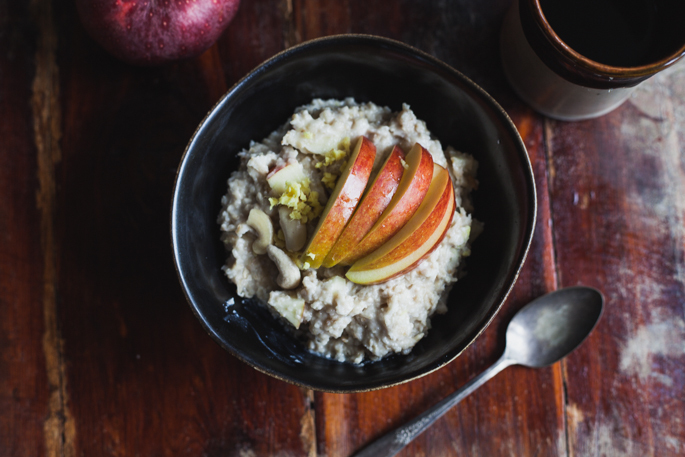 Leave the other wedges to garnish the top of your oatmeal -- optionally, mix your apple with lemon juice to keep it from browning (I also like the tanginess it lends to the sweet apple). Add the oats, salt, water, and coconut oil to a small pot. Place over medium high heat, and cook for 10 minutes or until the oats are meltingly soft. Cut off the heat, and fold in the ginger root, diced apple, and cashew cream. 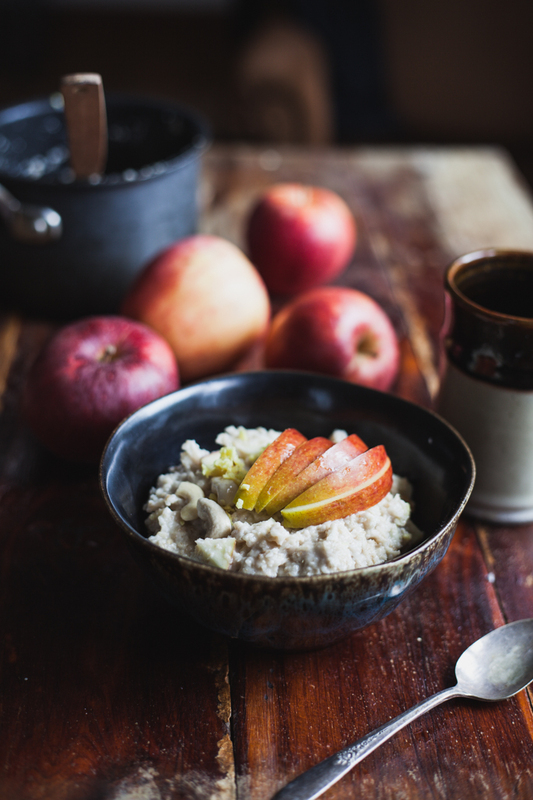 Top your oatmeal with your apples. If you'd like your oats a bit sweeter, add agave / maple syrup / brown rice syrup / honey a tablespoon at a time to taste (optional). p.s. Last week's Soom Tahini winner is Rebecca Pytell! Thanks everyone for participating!